We follow the rugged shoreline trail around the Svalvogar peninsula. Characterised by sharp cliffs and intimidating mountains, inspiring fjord views and surf battered beaches, colourful rocks and ancient volcanic layers, silent creeks and haunted valleys, rich birdlife and diverse vegetation; the Svalvogar trail offers an incredibly diverse experience. 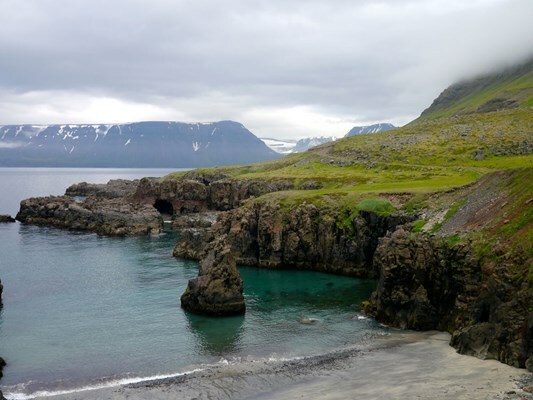 This tour is an unforgettable experience and in many ways the quintessential Westfjords day tour - all you need is the courage to go under the cliffs! Departure from The Wild Westfjords office in Ísafjörður. Suitable as part of a day trip by flight from Reykjavík. It is also possible to book this asa private tour for 6 - 14 pax. - Super jeep tour with English speaking driver guide, max 14 participants per jeep. To bring: Hiking shoes, lunchpack and drinks. Super Jeep with driver guide. Minimum: Min 2, max 4 ( room for one more person under 12 years). Note: This tour is not suitable for children under 6 years.